You can also see our art gallery. The automatic lava generator is pretty easy to make too. Just make a large chamber and put a inlet pump at the bottom and an outlet pump at the top. Wire them up with a 1 second timer and let it go. It won’t generate lava automatically but what will work is to put blocks separated by a single space all next to each other then take a bucket and dump a single load on top of each divider. Those will continue to split and if you leave and come back later your chamber will be full. You can then wire up a different outlet pump to pump all the lava wherever you want. This game is ridiculously fun and engrossing. 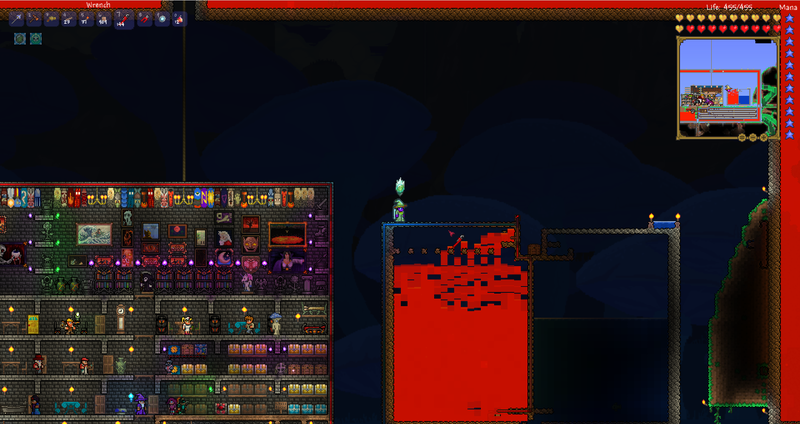 The new update is worth checking out even if you have played Terraria before.